It's probably been a half dozen years since I first ran across a foaming soap dispenser. I was in a Bath and Body Works store with my daughter. She's a fancy girl and I might be too given a larger budget. However, paying $6 or $8 for something that smelled a lot like Joy dish detergent wasn't my thing. I resisted the impulse to buy One More Thing that I didn't need at a high price. Often times I do that, especially with boat gear. With a bit of ingenuity I am able to make do. Plus, I enjoy the process. Nobody wants to spend perfectly good money. 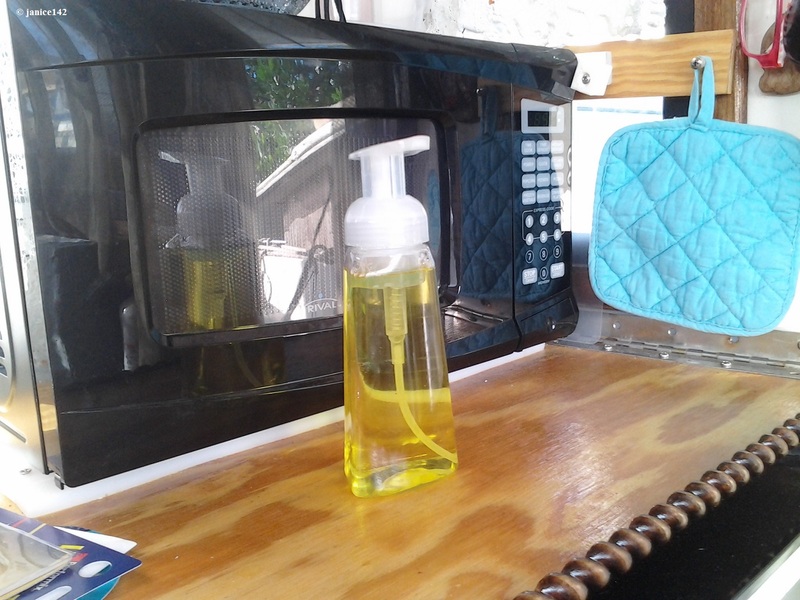 ↑ My low-cost version of the Lemon scented foaming soap dispenser. So, back to those fancy soap dispensers. They are lovely. I am not paying half of a ten-spot for a fancy bit of Joy dish detergent. That's not going to happen in this lifetime I can assure you. There are proponents of both brands. Bruce Van Sant of The Gentleman's Guide to Passages South and Tricks of the Trades fame is a proponent of Joy. I'm a Dawn girl. Both will make suds in salt water so pick the one you prefer. Dawn will get the grease or oil off my hands when I'm doing something icky in the bilges. That said, my friend Kim recommended a spray of Joy detergent on my potato plants when I started to get little flies around them. It works! Add some Joy (10%) to tap water in a sprayer. That's it. You're all set. Spray on the plant and voila: those itty bitty flies are gone. during a walk at the dog park with Skipper. The above sprayer is a container from one of those cheap imitation perfumes sold at dollar stores. Once emptied, I added a bit of Joy to the bottom. I then filled the bottle with water. 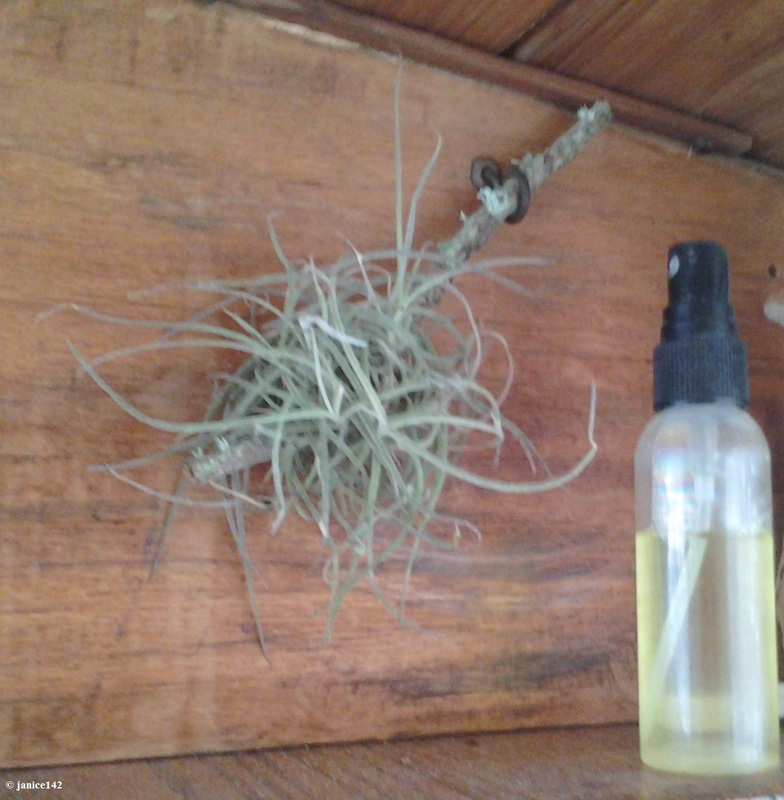 Spray on plants and the flies disappear. The soap seems to have no ill effect on the plants. It's an easy and inexpensive solution to flies. Joy has no effect whatsoever on *noseeums. *No-see-ums are flying wings with teeth that bite. Nasty critters, they are. Bats eat them. Noseeums can fly through your screen without slowing down. They are dreadful. Noseeums are the reason why I anchor far away from muddy shore lines where they breed. Of late those fancy foaming soap dispensers have popped up in the discount stores. I found mine in Dollar General. For a buck I had a dispenser that worked great. Until it was empty that is. I'd read on Pinerest that the dispenser could be refilled. The "secret" is in using a small amount of clear liquid soap and a lot of water. You also need the snazzy dispenser. That fancy top is a required component to success. Now we can find the foaming dispensers at discount stores. With the dollar store version of the container and a couple of ingredients I can have my own version of the pricy one I yearned for so long ago. Immediately my mind went back to the Bath and Body Works lemon-scented fancy gizmo. I had some leftover Joy from the dish soap my friend Kim gave me to get rid of the potato flies. Because it smelled lemony, I thought it would be perfect. I added about 3/4" of Joy at the bottom of the emptied dispenser. Filled to the top with water, I now have my own snazzy lemon scented soap gizmo. Side Note: The instructions I read on Pinterest indicated that clear soap must be used. I have not tried it with Caress body wash which is opaque. If you try it with something opaque, please do add a comment below. I like the way Caress soap smells. Thanks. J.
I tell you, the life of decadence is for me. And the dispenser (filled!) was just a dollar. Refilling probably took less than ten cents worth of Joy. Mine was free. Thanks Kim! And that ladies and gents is how to save money on a boat. The savings are going to be spent though, and soon. I've got an upcoming trip to the thrift stores with Cheryl who cruises onboard a Schucker. You met Cheryl in the Garbage Bag Solution article. See you on the waterways, and soon! Are you a Pinterest fan too? And have had success making any of the things you've pinned? Aphorism Alert: Why is lemon juice made with artificial flavor, and dishwashing liquid made with real lemons?